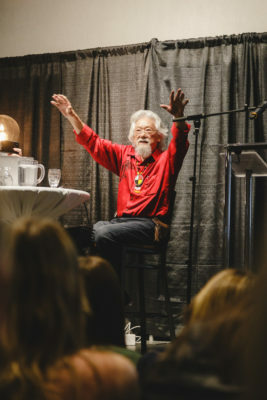 David Suzuki descended the stairs from the third floor of the Campus Activity Centre on Friday afternoon with a smile on his face as he socialized with Kamloops citizens, students and local sustainability organizations, including the TRU Eco Club and the Kamloops Blue Dot Network. The 82-year-old scientist, environmentalist and British Columbian sported a green North Face jacket as he indulged in catered snacks with attendees of his latest documentary, Beyond Climate, which would feature some hours later to a sold-out crowd. The film, directed by scientist and filmmaker Ian Mauro and narrated by Suzuki chronicles various British Columbian communities living through the current impacts of climate change, working to slow its disastrous effect. 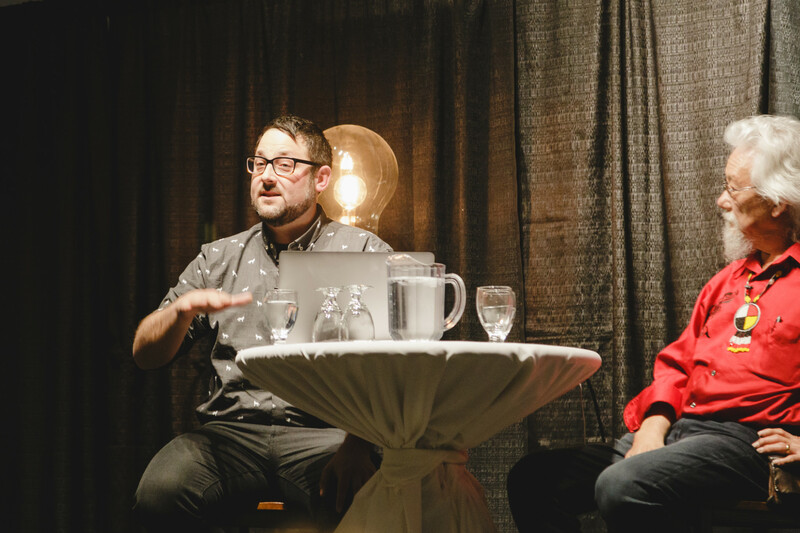 Mauro and Suzuki both have been touring the film across Canada to spread awareness on the impacts of climate change, interacting with communities like Kamloops and providing hope for the future. “I just want to remind you that you’re in a room with David Suzuki ladies and gentlemen,” Mauro proclaimed, exciting the audience into applause. The pair spent forty-five minutes speaking about their journeys as scientists and activists for the environment, being accepted into Indigenous groups from Haida Gwaii down to Vancouver Island and taking in their knowledge. “Everything I’ve learned about the environment in a deep way has been taught to me by Indigenous people,” Suzuki said. Suzuki credited much of his start towards a life of activism and enlightenment on these issues to Indigenous groups and elders that passed down their knowledge to him as a scientist and broadcaster. In a further conversation after the film, Mauro pulled up a slide on the projector showing the projected plus 30 degree days in a Kamloops summer using a program called the Climate Atlas of Canada. “In an average summer, you will know this; you have about 25 plus 30 [degree] days here. In that high-carbon far future, 2050 to 2080 that’s going to double. It’s going to jump to about 61.8 plus 30 [degree] days in an average summer in Kamloops,” Mauro stated. The conversation often shifted to political involvement in climate events, with Suzuki urging that all political leaders in all parties start to make climate their number one issue and told voters to elect anyone that does so. At the end of the night, both Suzuki and Mauro were met with a standing ovation from the crowd.